Scottish actor, Ewan McGregor, was born on this day in 1971. McGregor, as you probably know, stars as Obi-Wan Kenobi in the Star Wars films, episodes 1-3 [DVD STA]. 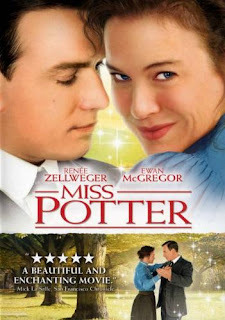 My favorite of his films is Miss Potter with Renee Zellweger [DVD MIS]. It's the story of Beatrix Potter and her editor, Norman Warne. There's some romantic movie chemistry between the two stars. Very nice! Another of his films that you can borrow is the little known British film about a brass band called Brassed Off [DVD BRA]. This film was released back in 1996 when McGregor was much younger. He's matured very nicely, I think! A mosquito bite had swollen into a massive lump stretching right across Ewan's forehead and on to the bridge of his nose, making him look like Neanderthal man with a huge, red, jutting brow. His arms were just as bad: puffy and red, the skin tight and sore around a string of mosquito bites. Not my idea of a fun vacation! Happy Birthday, Ewan, and many more! Stevenson's poems are playful. He plays with the words, their placement on the page, their size and shape, etc. Some of his poems depend upon the illustrations for context, so it is better to browse through the books rather than spend any more time reading blogs! In our collection we also have Corn-Fed: Poems [J 812 STE] and Popcorn: Poems [J 811.54 STE]. On yesterday's date, in 1885, the Eastman Dry Plate and Film Co. of Rochester, New York, manufactured the first commercial film. Just two years later, Kodak introduced it's first camera, and in that same year, the first motion pictures were made. (A timeline of early photography can be seen here.) Fast forward to 2001, and you'll we find the ten major motion picture film companies accounting for more than $8 billion in revenue! We have a DVD that includes some of the early films of Auguste and Louis Lumiere, Lumiere Brothers' First Films [DVD 791.43 LUM]. These films were made during 1895-1897, and shown to the public, only ten years after the introduction of the first commercial film. The amazing part of the DVD for me is the clarity of the images. I would have thought that there'd be major damage considering how old the movies are. To learn more about the Lumiere brothers, visit this site. Moving forward a few years, we have a weighty (literally) volume of motion picture history called Conversations with the Great Moviemakers of Hollywood's Golden Age at the American Film Institute edited by George Stevens, Jr. [791.43 CON]. Stevens is the son of the famous director, George Stevens, and his mother worked in Hollywood during the early years, so he comes steeped in film history. Some of the moviemakers covered are Fritz Lang, Frank Capra, William Wyler, Alfred Hitchcock, John Huston, and Frederico Fellini. A brand new book we just received is Pictures at a Revolution: Five Movies and the Birth of the New Hollywood by Mark Harris [791.43 HAR]. There was nice review of it in the New York Times. It might be fun to read the book and then watch the five films, which were nominated for the 1968 Academy Award for best picture. We have them all--Bonnie and Clyde, Dr. Dolittle (the Rex Harrison version), The Graduate, Guess Who's Coming to Dinner?, and In the Heat of the Night. This is going to sound crazy. Say yes to everything. Accept all offers. Go along with the plan. Support someone else's dream. Say "yes"; "right"; "sure"; "I will"; "okay"; "of course"; "YES!" Cultivate all the ways you can imagine to express affirmation. When the answer to all questions is yes, you enter a new world, a world of action, possibility, and adventure. How are your powers of observation? How much do you notice and remember? This skill is at the heart of all improvising. What we notice becomes our world. So observe what is going on around you. Open your eyes, and notice the detail. See what is actually happening. Pay attention to everything. Most of what the author presents, if followed, would result in a life well-lived. Take a look at Improv Wisdom. 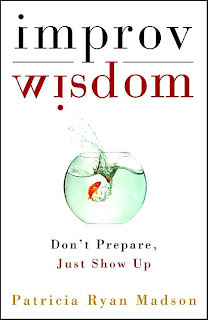 It's short, at 159 pages, and will take you no time at all to read through. We have to respect the book for what it is: an art object that we should defend, defend against censors, narrow-minded educators and, most of all, the dangers of war. Fiction has described wars better than any history book because a novelist, a true novelist, is not a warrior. Literature and war carry opposite genes.--Mai Ghoussoub, from "Texterminators," published in this month's issue of Words Without Borders. Two milestones in the Iraq War occurred this past week--the war entered its sixth year on Wednesday, and the 4,000th American service person was killed yesterday. New Hampshire has reached its own milestone of sorts. We lost another guardsman on Saturday, bringing our total to 25. After 5 years of war, our collection of items relating to the Iraq War has increased. Most can be found in 956.7044, and cover a variety of topics, from opinion pieces to experiences of the men and women who were over there in the thick of it. If you're still undecided about the war and the United States' involvement in Iraq, you may wish to look at Iraq: Opposing Viewpoints [956.7044 IRA]. This book looks at a number of questions and includes essays in pairs. For example, "A Failure to Find Iraq's Weapons Calls into Question the Justification for War," by David Corn is counterbalanced by "War Was Justified Even If No Weapons of Mass Destruction are Found," by Michael Schrage. The Iraq War will be discussed for years to come, no matter when it ends, so visit the library often to see what is new. Spring arrived officially on Thursday. I found a poem by John Dryden called "Song to a Fair Young Lady Going out of Town in the Spring"
And winter storms invert the year? Happy spring, and if you celebrate it, Happy Easter on Sunday! Appelt, Kathi. Bubba and Beau Meet the Relatives. [JP APP]. These characters, one dog, one human, have no problem getting dirty! 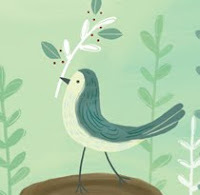 Dewey, Jennifer Owings. Mud Matters. [J 553.6 DEW]. A look at the many uses for mud! Haskins, Lori. Stuck in Muck. [E HAS]. For the beginning reader who also likes trucks! Lewison, Wendy Cheyette. Mud. [E LEW]. If the thought of dirty hands and feet makes you squeamish, skip this little rhyming book! Mud is oh so oofy-poofy. 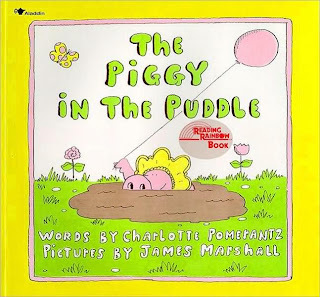 The silliness of the text, accompanied by the illustrations of the late James Marshall, make this title a hit in my book! Ray, Mary Lyn. Mud. [JP RAY]. The fact that the author is a New Hampshire resident is obvious. This writer really knows her mud! Stop thinking like a stuffy old adult--some nice warm day take your shoes off and really experience mud season! For most of us, it’s a short walk to the faucet in the kitchen, or bottled water in the refrigerator. But for more than a billion people – about one in six people on earth – getting safe water each day is no easy task. Women and children around the world walk 200 million hours every day for water – water that often comes from a polluted source. 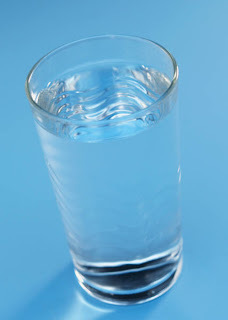 Here in New Hampshire we hardly ever worry about having clean water to drink--we're only a short drive away from a supermarket, where, even in a local water crisis, we can purchase all the water we need. But imagine what it's like to not have safe drinkable water. Think of those who must struggle on a daily basis to obtain water to drink (never mind having enough water to wash your car or keep your lawn green). Let's be thankful for what we have--clean water may not always be available (look at the drought going on down in Georgia). Water Partners is using a micro-finance program to provide water to citizens of the third world. Micro-finance has received a lot of publicity over the past several years, and deservedly so. The Nobel Peace Prize, in 2006, went to Muhammad Yunus, author of Banker to the Poor: Micro-Lending and the Battle against World Poverty [B YUN]. This site has more on micro-lending if you are interested. Recess--It's Not Just for Kids! 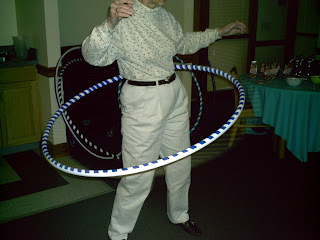 A staff member checks out one of Trudie's "adult-sized" hula hoops. They're fantastic! We're having a program next Friday, the 28th, at 11 am, conducted by Trudie Young, the "Recess Lady." You may have read about Trudie recently in a Sunday edition of the Nashua Telegraph. Trudie re-introduces adults to the fun of recess. She brings along hula hoops, games, snacks, jump ropes--almost everything you remember from your days on the playground, except for the bullying and the teasing! There is no preregistration, so feel free to bring a friend with you. It seems like play for adults is becoming more prominent--Barbara told me about a segment she saw on Good Morning America today, which showed a playground for "seniors." Famous people have shared their memories of play in The Games We Played: A Celebration of Childhood and Imagination [305.23 GAM]. It's a short little volume, but it may start you off on your own trip down memory lane! Enjoy the ride! I hope you're wearing green today. If you don't wear it any other time of the year, this is the day to do it. It's too late for this year to visit Ireland for St. Patrick's Day, but at IrishAbroad.com you can find a celebration closer to home. Songs have been sung and poems have been written about Colcannon, a traditional Irish dish associated particularly with Halloween. That may be so, but a cool March day seems like a perfect time for it! Round out your carbs with a nice cold glass of Smithwick's or Sam Adam's Irish Red and toast all the Irish (and Irish-wannabes) with a rousing Slainte(pronounced slawn-cha)! To your health! Poetry doesn't have to be stuffy and full of hidden meaning. You can have fun with it. Many years ago, at a writers' retreat, I played a game called "Exquisite Corpse." About 5 or 6 of us sat in a circle and received a blank piece of paper and a writing implement. At the top of the paper we each wrote down two lines to start a poem. It wasn't necessary to rhyme, although it was allowed. When everyone had finished--spontaneity is the key to this--then the first line was folded under, and the paper was passed to the person on the right. That person read the exposed line and added another. Again, the top line was folded under and the paper passed. The addition of lines continued until each person received her own paper back. At that point, the paper was unfolded, the poem was read, and the starting person added a final line. Then the poems were read aloud. Amazingly, some were quite cogent! We had fun and continued the game with a new piece of paper. I'd like to suggest that you try this old parlor game. People will have to give up their laptops, which may be a good thing, and get back to basic pen and paper. I'd love to see your resulting poems! One of my favorite books is The Adventures of Dr. Alphabet: 104 Unusual Ways to Write Poetry in the Classroom and the Community by David Morice [372.64 MOR]. It has a dizzying number of playful activities with poetry. And, I'd like to stress the COMMUNITY aspect. Adults of all ages can participate. 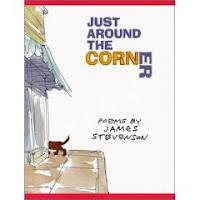 This book is a great resource for those who are planning activities for Poetry Month coming up in April. One student's poem is another student's puzzle. In this case, the second student tries putting the poem back together. Each student arranges ten popsicle sticks in a rectangle and writes a poem on them, one line per stick. Then everyone exchanges sets of sticks and tries to arrange each other's set in the order of the original poem. The students can also collaborate on larger poems by arranging the sticks from two or more sets. In case you're wondering where the name "Exquisite Corpse" came from, here's an explanation from Wikipedia. Yesterday I mentioned the new book we recently purchased, America's Best Lost Recipes [641.5973 AME], and it got me to thinking about some sweet things from my past such as Devil Dogs! The Devil Dogs of today pale in comparison to the memory of the Devil Dogs of my youth. Those I remember as a rich devil's food cake with creamy filling in the middle. The ones you get today are composed of a favorless pale brown cake. It's supposed to be chocolate, but if it is, I must be missing some taste buds! The cream filling is sugary glop with an oily finish. If you miss the Devil Dogs of your youth, you can recreate the flavor, if not the hotdog shape. Here's a link to Smitten Kitchen's Devil Dogs Ding Dong or Hostess Cake. To see what goes into today's Devil Dog, visit the site, Food Facts. Did you read through the ingredients? If so, I need say no more to convince you to look for alternative recipes for resurrecting the tasteful memories of your youth--right? We've added a new cookbook to our collection called America's Best Lost Recipes: 121 Kitchen-Tested Heirloom Recipes Too Good to Forget [641.5973 AME] by the Editors of Cook's Country Magazine. Some things are just crying out to be lost. Bad supermarket tomatoes. SpongeBob SquarePants Cereal. Breakfast at McDonald's. Halftime at the Super Bowl. Any recipe that starts with a can of cream of mushroom soup. And don't forget children's books penned by celebrities and casseroles with overcooked broccoli. I'd suggest putting a hold on the book, because otherwise, the staff may keep it out forever! Fiction is Make Believe--Memoir Shouldn't Be! And yet, authors, and their publishers, continue to try to get away with selling their fiction as memoir. You would have thought that there would have been a little more vigilance after James Frey's A Million Little Pieces fiasco. This past week in the news comes the revelation that two more hoaxes have been perpetrated on the general public: Love and Consequences by Margaret B. Jones and Surviving with Wolves by Misha DeFonseca. Literary fraud is nothing new of course. Here's an entry from the Columbia Encyclopedia [R 031 COL]. The New York Times covers more recent fraud in A Family Tree of Literary Fakers. Let me suggest a few recent memoirs that, so far, have not proven suspect! These tweens, as they're called, are now spending $51 billion of their own pocket money. And marketers, sponsoring birthday parties and sleepovers, are eager to know what a girl wants -- at age 10 and 8, even as young as 6. Part of the On Point discussion dealt with the body image marketers are thrusting on impressionable young girls. If teens are having problems with reconciling their own body image with what advertising is projecting, then how much more difficult is it for a tween? I had been thinking about Robert Frost yesterday and wondering if he had any mud season poems since we are entering that wonderful time of year. And sure, enough, I found "Two Tramps in Mud Time." Doesn't this say it all! Read the whole poem here, or in Collected Poems, Plays and Prose [811 FRO]. To which I say, so what? You'd be hard-pressed to find a San Franciscan poet who could capture mud season so well! Fever Pitch with Colin Firth (1997). [DVD FEV] This film was adapted by Nick Hornby from his novel of the same name and is the story of a British school teacher obsessed with his soccer team, the Arsenals. You may recognize this storyline as the basis of the 2005 film of the same name starring Drew Barrymore [DVD FEV] about the Boston Red Sox. I think the second film is much better, but it is fun to compare the two. The Shop around the Corner with James Stewart (1940). [DVD SHO] This is the original film upon which the 1998 film about an email correspondence, You've Got Mail, was based [DVD YOU]. 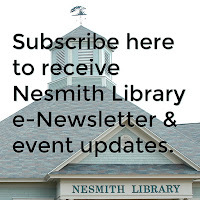 We are getting new films in all the time, so visit the library often! Primary Season--Will It Never End? It basically ended for the Republicans last night when John McCain reached the magic number in the delegate count, but the Democrats are still battling it out! The next "big" primary (188 delegates) will be April 22 in Pennsylvania, so we're in for a lot more squabbling between Clinton and Obama over the next seven weeks. Frankly, I'm suffering from political fatigue and we still have eight months to go before the election! Time Magazine's cover story for March 10, How Much Does Experience Matter? provides food for thought. It may be worth a read. Campaigning for President: Memorabilia from the Nation's Finest Private Collection by Jordan M. Wright [324 .973 WRI] covers the history of the races between national candidates and the paraphernalia associated with them. Presidential political memorabilia began with the first president of the United States. Brass clothing buttons commemorating Washington's ascension to the presidency were mass-produced. The chain of thirteen links represents the original states. Many appeared with the slogan "Long Live the President." This coffee table book is fun to browse through with its full-color photos of such items as a Henry Clay clay pipe, the William Henry Harrison parade torch in the shape of a top hat, or the Teddy Roosevelt jointed doll. It almost makes me look forward to the upcoming race, if only to see what fun and funky items come out of it! Bacon and Butter are Not Dirty Words! Cholesterol is not something to be eliminated from the diet. Cholesterol is vital to health. LDL, which patients may have been told is "bad cholesterol," actually has a protective element--it guards against infection. Stress, rather than cholesterol, is a major factor in the development of heart disease. Highly processed foods often contain an excessive amount of soy products, which may be harmful to the thyroid (another reason to avoid processed foods). The problem for some people is not that they don't get enough calcium, but that it is not absorbed by the bones. It is a lack of magnesium and vitamin D3 that is the problem--these aid in the absorption of calcium. A lack of fats in our diets can be harmful. What should be eliminated are polyunsaturated fats and trans fatty acids. Olive oil and coconut oil are good to have in your diet. Eat well--a balance of carbohydrates, protein, AND fats in an approximate ratio of 40-30-30. Gittleman, Ann Louise. The Fat Flush Plan. [613.2 GIT]. And these websites: The Weston A. Price Foundation; The Natural Health Information Articles and Health Newsletter by Dr. Joseph Mercola. Have you heard the news? Prince is going in for hip replacement surgery! That's what happens when you dance in platform shoes! Of course I have "Let's Go Crazy" running through my head. And, I'm sorry to say that we don't have Purple Rain in our collection, but we do have Prince's 2007 release, Planet Earth [CD ROCK PRI].